Welcome to Smoothie Monday! You know what healthy, good for you fruit is now in season? Pomegranates! I love pomegranates! They are full of antioxidants, vitamin K and are a healthy benefit to your diet! Since these little red jewels are in season, I thought I would whip together a healthy, fun drink. 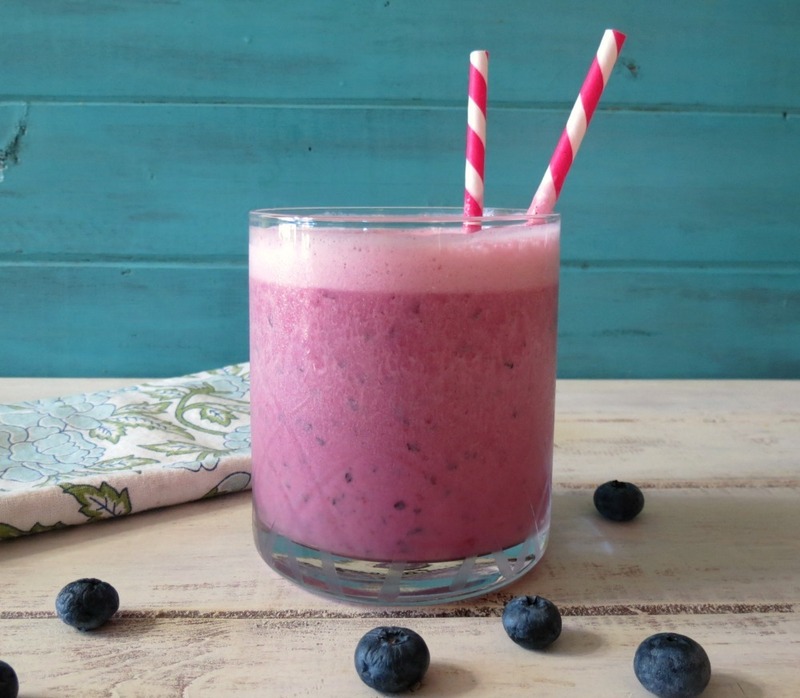 My Blueberry Pomegranate Smoothie! 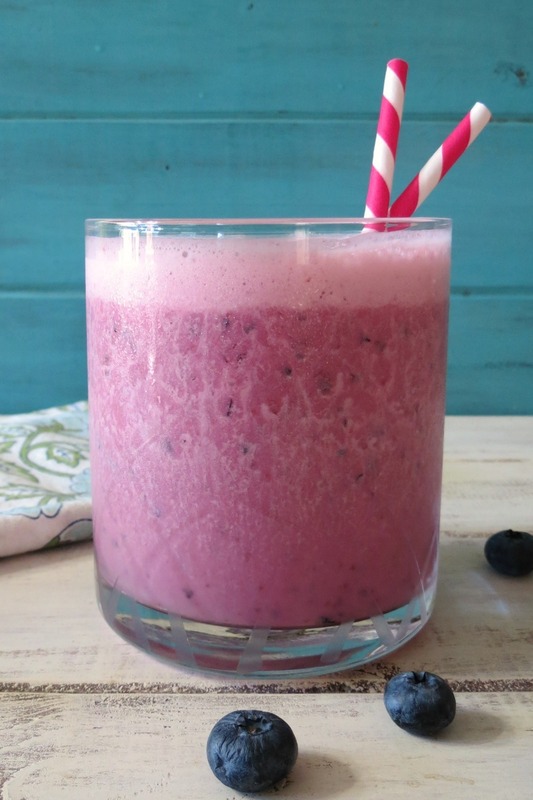 This smoothie is a breeze to whip together! I used POM Wonderful Pomegranate Lite, frozen blueberries, greek yogurt and a pinch of stevia and vanilla extract to sweetened it up. This drink is slightly tart, yet has a nice sweet flavor to it. It’s also thick and creamy!! It’s perfect for an afternoon pick-me up!!! I made this smoothie on Saturday afternoon and shared it with my Husband. He was working in the garage and I thought a nice smoothie would cool him off. I swear the man lives in the garage. I had my smoothie outside while I watched the dogs play in the yard. We are just having the nicest Fall weather this year. I hope it stays like this for a while. I also decided to make this smoothie because I have had a beautiful pomegranate staring at me all week. My CSA brought my one last week. I haven’t figured out how to cut it open yet. I probably should google it first since I heard they could be messy! Have you every cut a fresh pomegranate? I cheat and just buy the juice or arils. 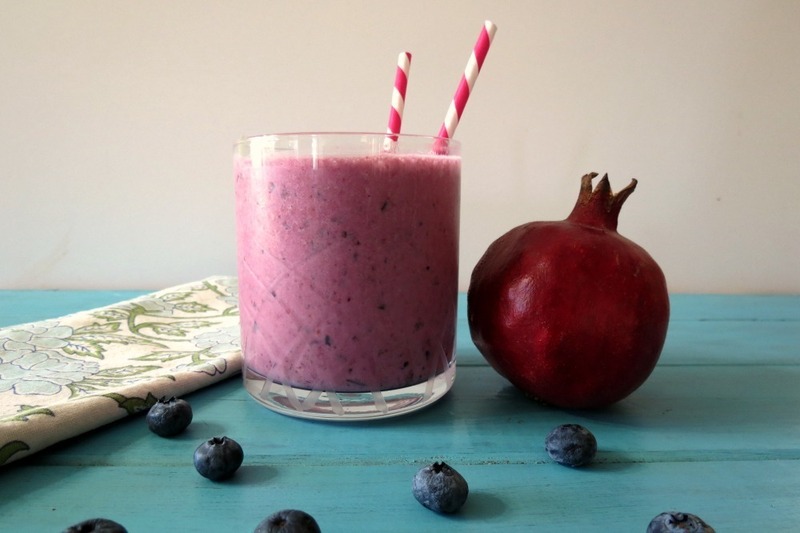 A healthy, creamy, sweet with a pinch of tartness smoothie made with pomegranate juice and blueberries. Note: You could sub vanilla greek yogurt for plain, just omit the vanilla extract and stevia. 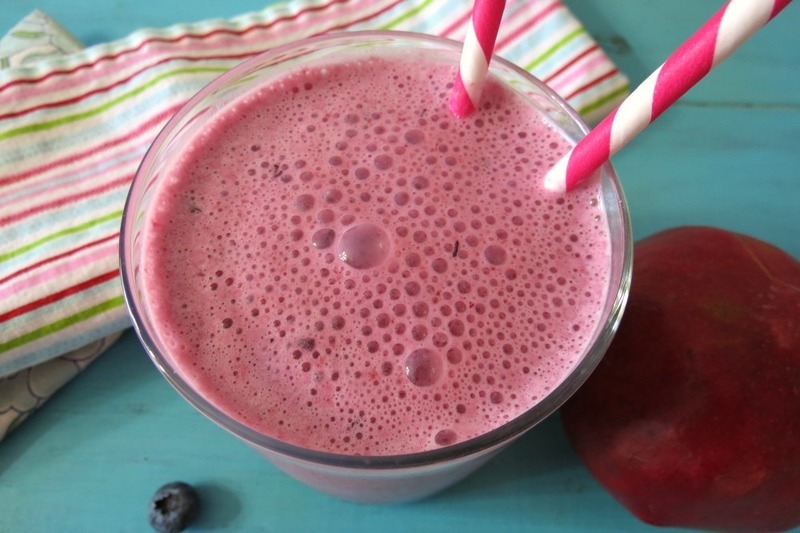 This is such a nice simple smoothie loaded with so much flavor and nutrients. I love when simple ingredients come together and just “POP” with flavor. This is one to go in the books! I think the photos look GREAT! Love the colors! What time of day do you usually photograph? Morning? Hi Sophia! I take my photos when I’m not at work at 10am. During the week, I take them around 5pm and again around 7pm. I found the best sun light is between 10 – 11 am. The afternoon sun is the worse in my home. 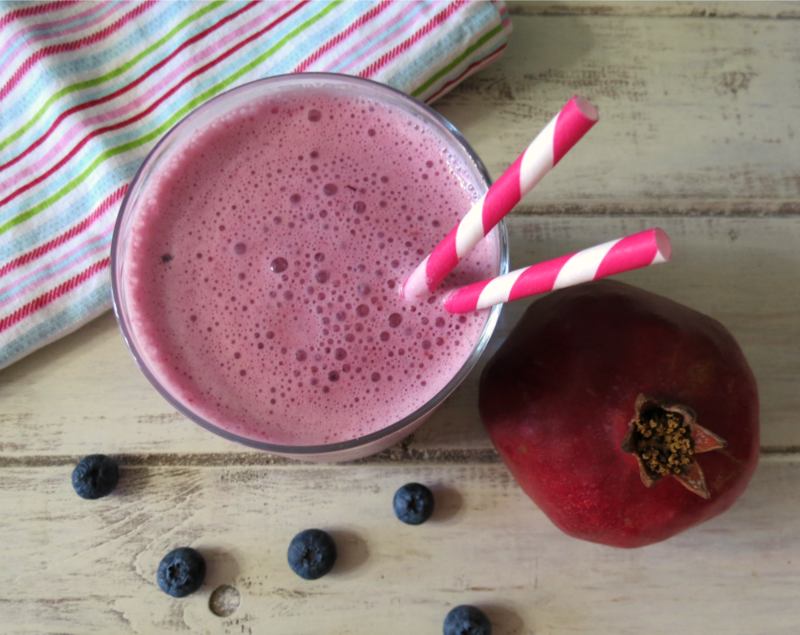 Oooh, I love pom smoothies! With blueberries too, what a great combo. And don’t be scared of a pomegranate fruit! Just cut it open, then submerge it the halves in a bowl of fresh water. Using your fingers, you can dig out the arils- it doesn’t take too long. The yellowy pith will fall to the bottom of the bowl since it’s heavy, and the arils will float to the top. If you try to open the pomegranate and remove the arils on a cutting board, you run the risk of your kitchen looking like a crime scene, since the juice will spray all over, lol. Thanks Ruthy! I think I am going to try cutting the pomegranate this way. I don’t want a crime scene look in my kitchen! 🙂 I did that once by dropping a jar of jam. Not pretty!! I always buy fresh whole pomegranates. I bought one a few weeks ago and they didn’t seem quite ready, but hopefully they’ll be better now. They are messy, but if you’re careful, you can contain the mess. So worth it too – yummy! Love smoothies and this looks wonderful and refreshing. Wishing for a warm winter too! Now I can’t wait to try my pomegranate! Hi, you also can squeeze the pomogrant, I leaned this tip from Rachel Ray, you press down firmly on the pomogrant and roll it around a little to loosen the arils, then you cut a small slit in it and squezze it into a bowl or glass. Takes a little work but it states so yummy and fresh! Ohhh, I have to give it a try. Thank you so much for telling me. I am excited to try it. I think tomorrow I’ll break it open. 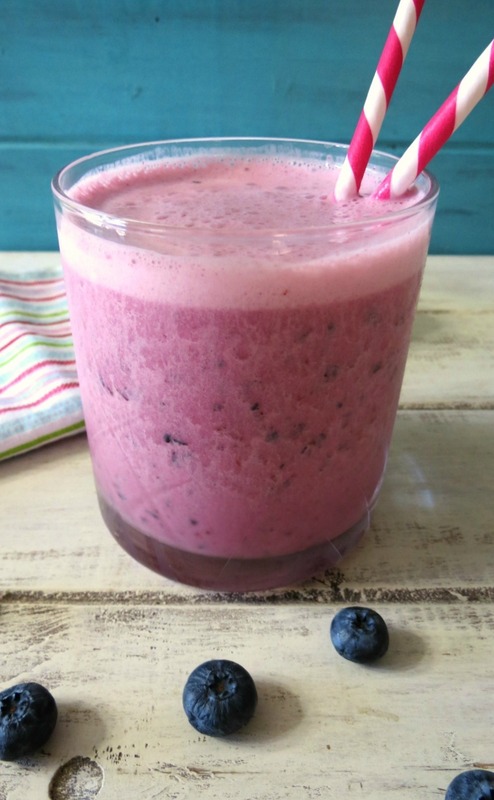 Gorgeous smoothie, Jen! Much as I know those green smoothies can be tasty and healthy, it’s the berry ones that call to me. Like yours!